Famous in Europe and North America for being grand shade trees, lindens (Tilia spp.) also produce fragrant tiny greenish flowers that honeybees use to make a distinctively flavored honey. Deciduous, linden trees bear smooth bark and an oval to pyramid-like canopy with heart-shaped leaves. Choose a tree that is winter hardy in your region and tolerates your soil pH and moisture conditions. Usually called basswood, the American linden (Tilia Americana) grows large and imposing, not typically grown in residential gardens. It matures to 60 to 80 feet in height and 20 to 40 feet in width in deep, fertile and moist soils. 'Fastigiata' is a narrower oval, upright selection and 'Redmond' grows to 50 feet tall and 22 feet wide. Grow them in USDA Hardiness Zones 3 though 7. 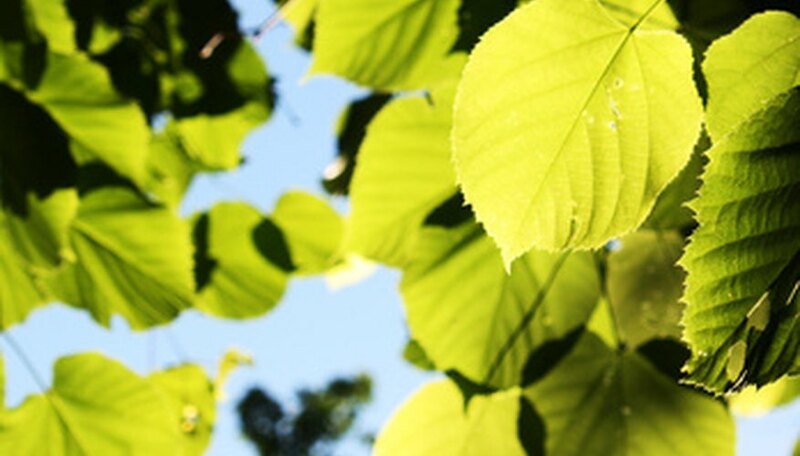 A well-shaped tree for use in yard, parks or lining avenues, littleleaf linden (Tilia cordata) has a reputation for tolerating tough urban conditions such as heavy clay, alkaline soils and moderate drought better than other lindens. Branches also take well to shearing to create tall hedgerows. The tree typically matures to 30 to 50 feet tall and 20 to 30 feet wide. A tight pyramidal canopy forms on 'Chancellor' and 'Greenspire' while a more oval, openly rounded canopy develops on varieties 'Glenleven' and ' Olympic'. Abundant amounts of bee-attracting flowers occur on 'June Bride', and 'Summer Sprite' grows slowly to just 20 feet tall and 10 feet wide. Quite cold hardy, grow littleleaf lindens in USDA Hardiness Zones 3 though 8. Also a large shade or park tree, the silver linden (Tilia tomentosa) grows large heart-shaped leaves with silvery undersides that become most attractive in a sweeping breeze. Its smooth trunk bark also displays a silvery to pale gray tone. This species tolerates summer heat better than others. Young leaves on 'Sterling' display an especially silvery cast and overall this variety's branches develop an attractive structure and silhouette. 'Princeton' develops a broad pyramid-like canopy as does 'Green Mountain', which is fast growing. Silver lindens grow best in USDA Hardiness Zones 6 through 9. With the misleading name of "bigleaf", this species' leaves really are no larger than any other species but the stems are covered in long hairs, unlike any other linden. Bigleaf linden (Tilia platyphyllos) lines the formal boulevards and grand allees across much of Europe. Both 'Princess Street' and 'Rubra' are selections with vibrant, red-tinted young twigs. Grow this species in USDA Hardiness Zones 5 through 8. Two man-made hybrids of note include the European linden (Tilia x europea or Tilia x vulgaris) and the Crimean linden (Tilia x euchlora). These two species grow well in USDA Hardiness Zones 3 or 4 through 7. The weeping silver linden (Tilia 'Petiolaris') is regarded by most botanists as a hybrid with a large size and weeping branches and drooping twigs. It grows 100 feet tall and 70 feet wide and best in USDA Zones 5 through 9.